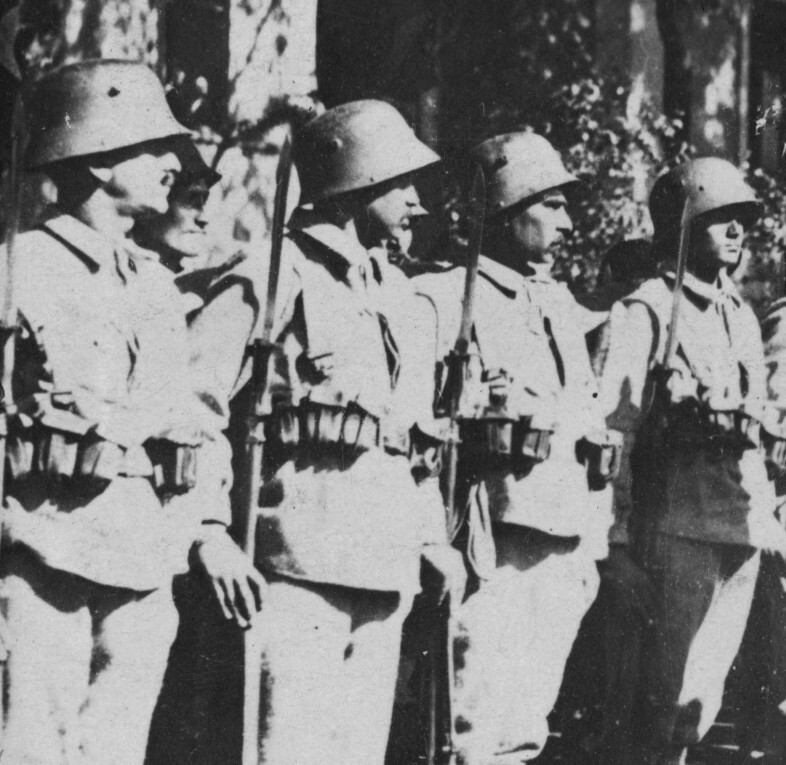 Those of us who study World War I are aware that Turkish soldiers began wearing visorless steel helmets in 1917. 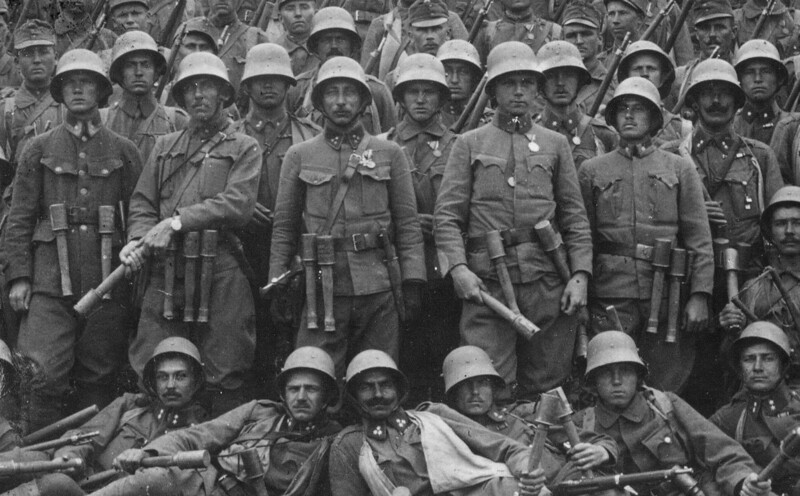 As far as I can tell, not a single historian has commented on the fact that all of the Central Powers used visorless helmets. Except for one Turkish and one German model, they were field modifications, created in order to improve vision. 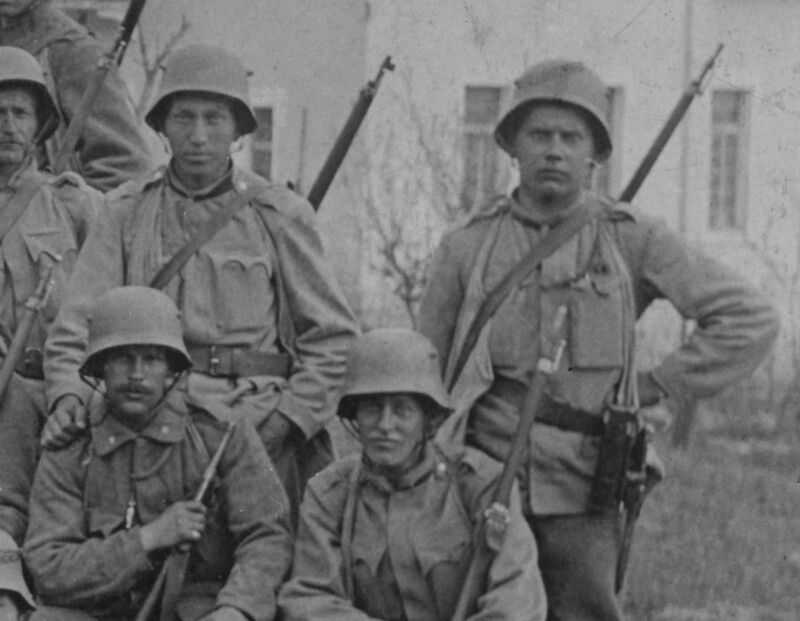 I base this conclusion on the fact that soldiers of the Central Powers often wore their steel helmets backward. 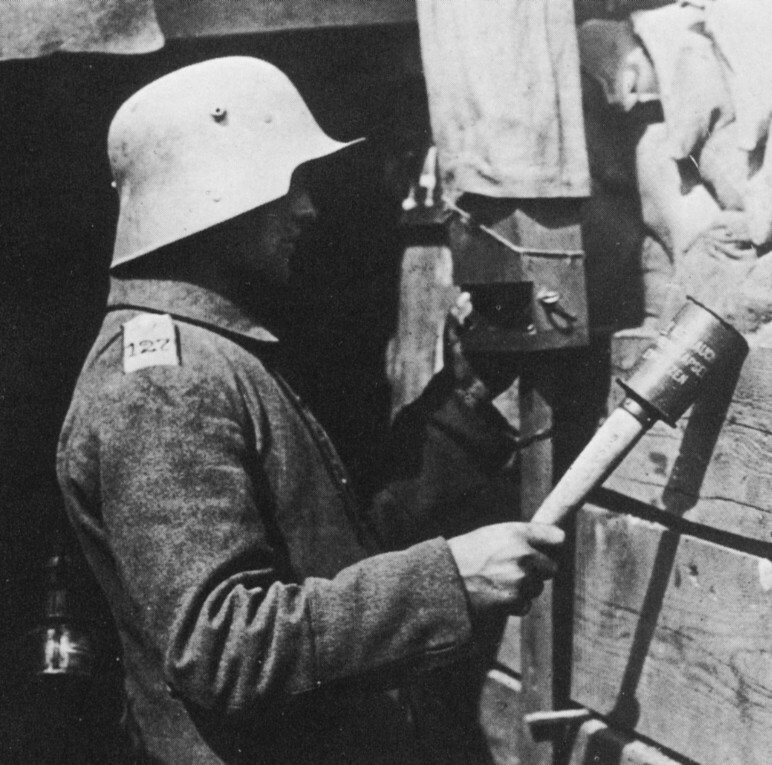 First, the necessary vocabulary, illustrated with a German M1916 steel helmet (Stahlhelm). Click all images to enlarge. The Turks used two models of steel helmets: the M1916 conversion and the M1918 Eisenhüttenwerk Thale purpose-made helmet. In the case of the conversion, the visor, the dips, and the lower portion of the flared bell were cut off, leaving a raw edge. This Turkish honor guard greeting Kaiser Wilhelm II in Constantinople, November of 1917, wears the M1916 conversion. The soldier second from the left also wears his helmet backward. Originally I thought he did so because he was unfamiliar with this new piece of equipment, but I’ve since learned that assault troops of the Central Powers often wore their helmets backward, almost certainly to improve vision and possibly hearing. Also, reversing the helmet would prevent the visor from falling down over the soldier’s eyes when he ran, jumped, or threw himself to the ground. 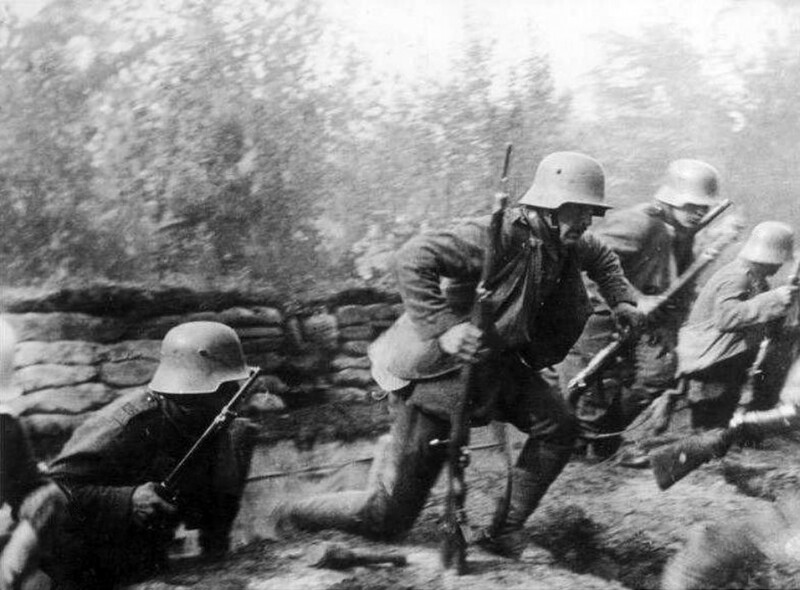 In this photo of German assault troops leaving their trench, the soldier second from the right is almost blinded by his helmet visor, which has dropped forward and to his right. Also, the square dips would certainly inhibit peripheral vision. 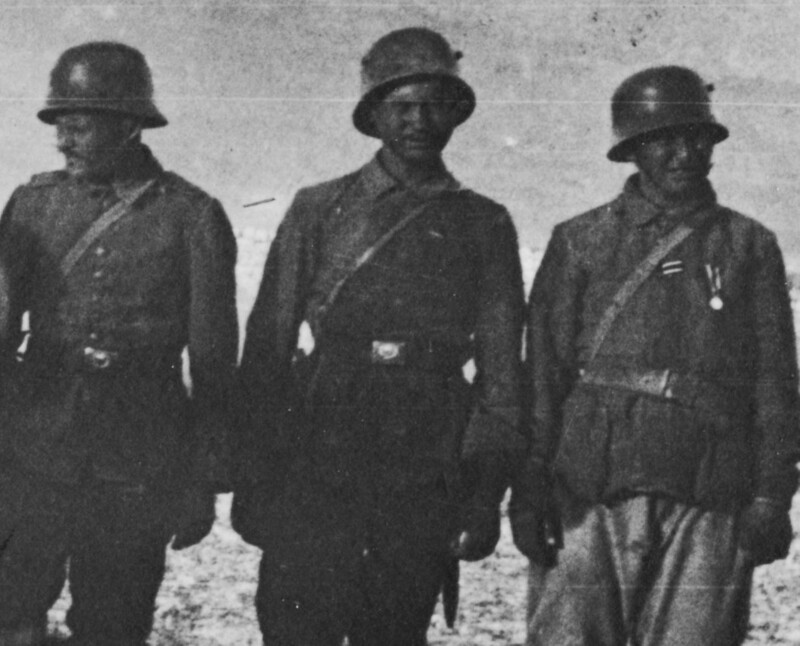 These Turks in Palestine wear a converted helmet (left) and two M1918 Eisenhüttenwerk Thale helmets. It’s obvious that they have a much greater field of vision than the Germans in the photo above. 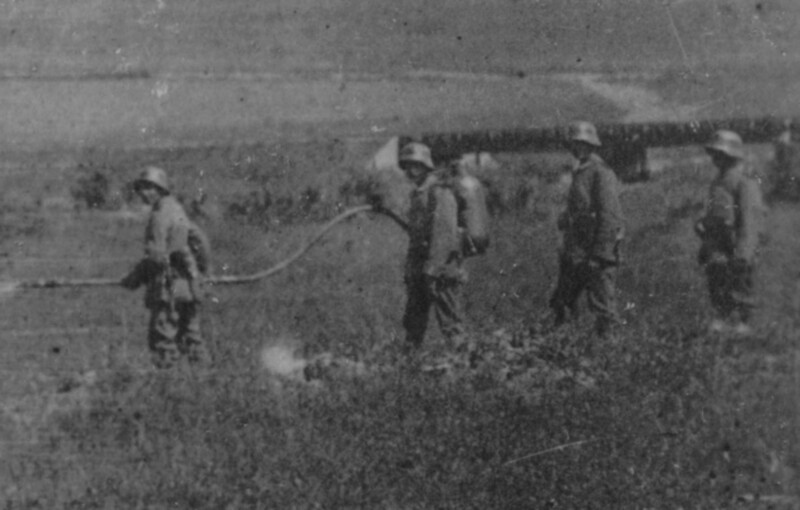 Small flamethrower shock troop (Kleifstosstrupp) of the Ottoman XV Army Corps, at Rohatyn, Galicia, in the spring or summer of 1917. 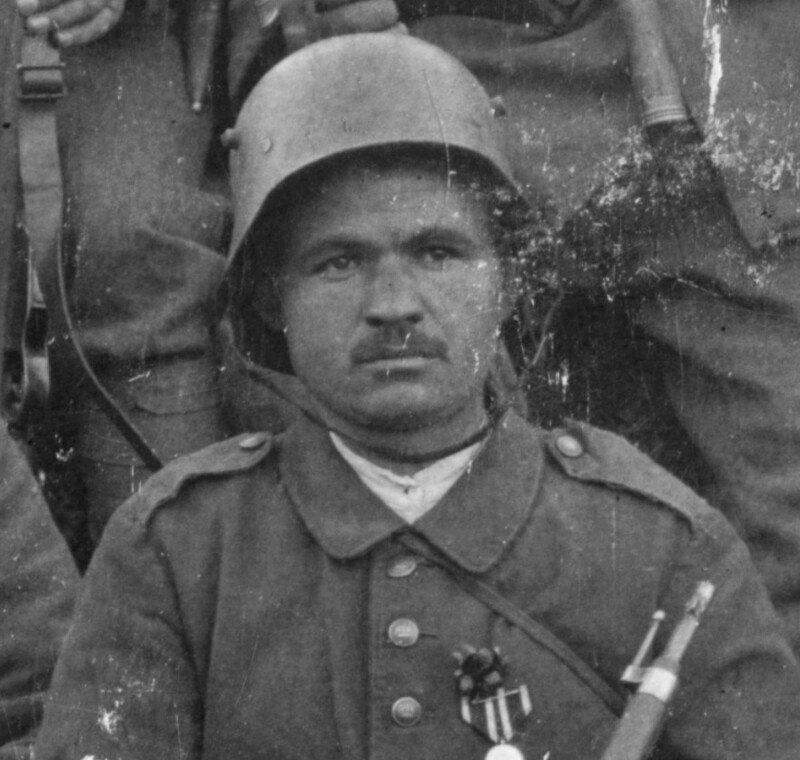 They are armed with the Kleif M.1917, and their modified M1916 helmets have been rather jaggedly cut, especially around the back of the bell. All the men appear to be equipped with flameproof balaclavas; they may be members of the Istanbul Fire Brigade. Ottoman Assault troops reviewed by Austro-Hungarian Emperor Charles I in Constantinople, 1918. 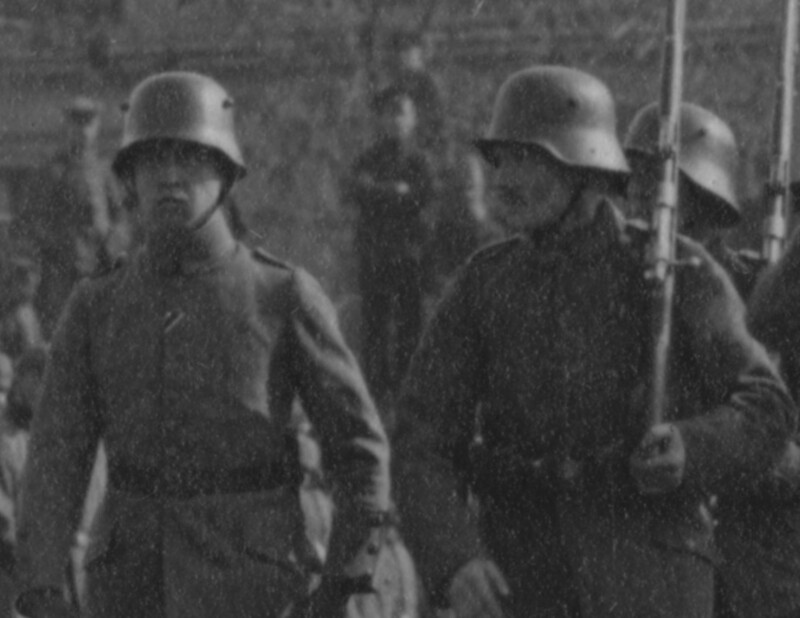 They wear the M1918 Eisenhüttenwerk Thale helmet. 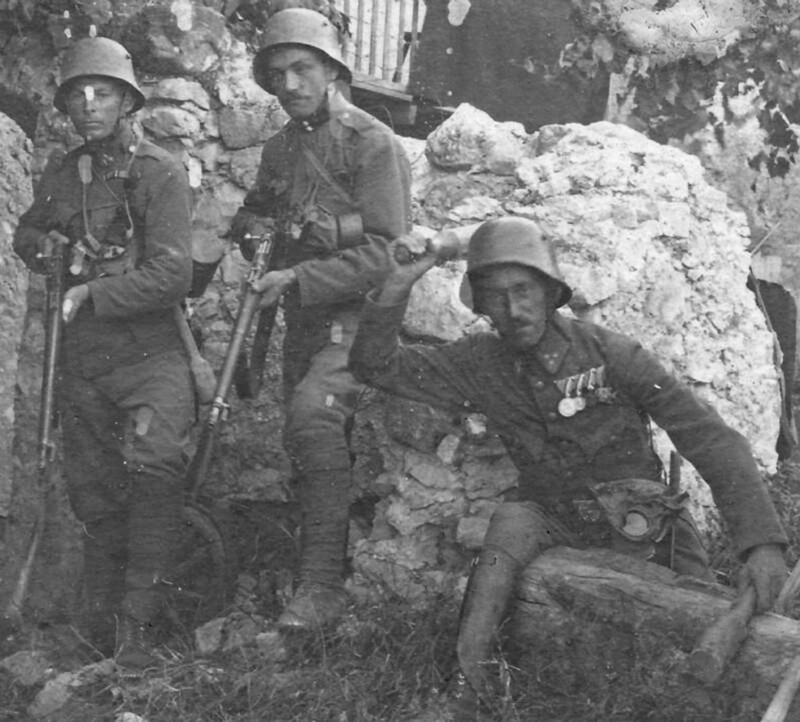 Ottoman assault troops in Palestine, 1918. 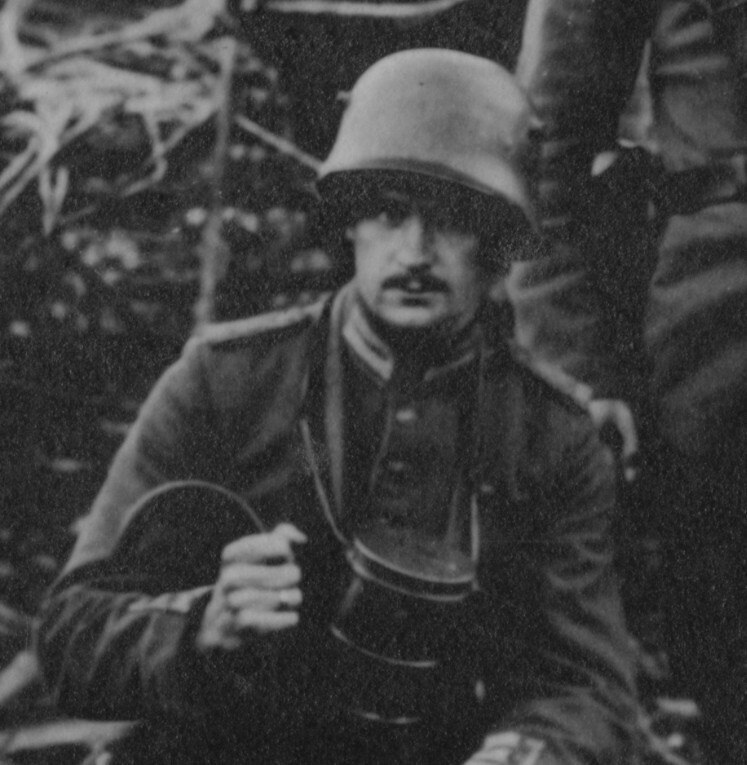 Again the helmet is the M1918 Eisenhüttenwerk Thale. The German M1918 visorless helmet is often called the “Turkish variant,” but this version was actually produced for German troops. It was used by the German postwar army and Freikorps during the German civil war of 1918-1923. In my opinion the curved edge of the helmet front is an outgrowth of the field conversions shown below. 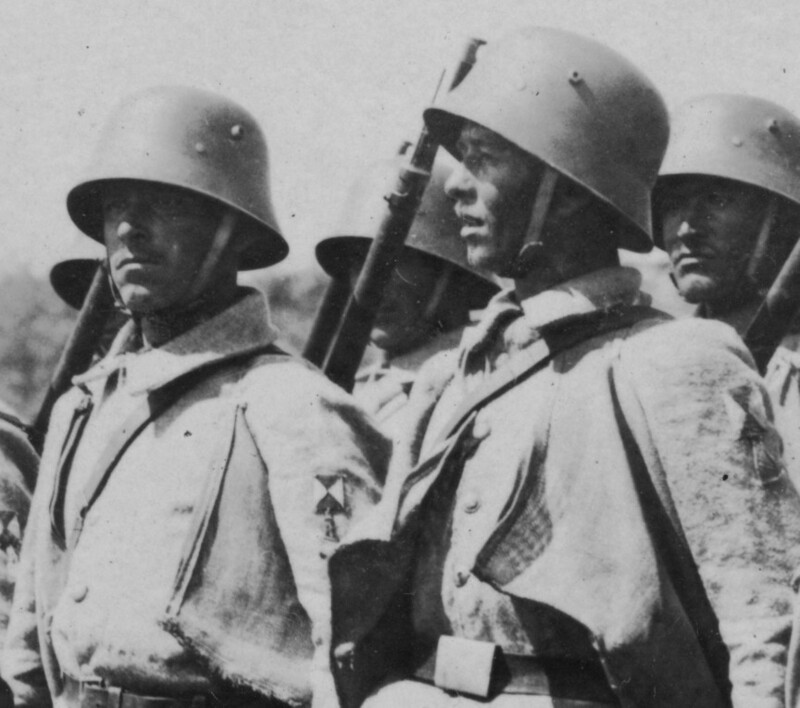 Prior to creating visorless helmets, the Germans wore the standard helmet backward. 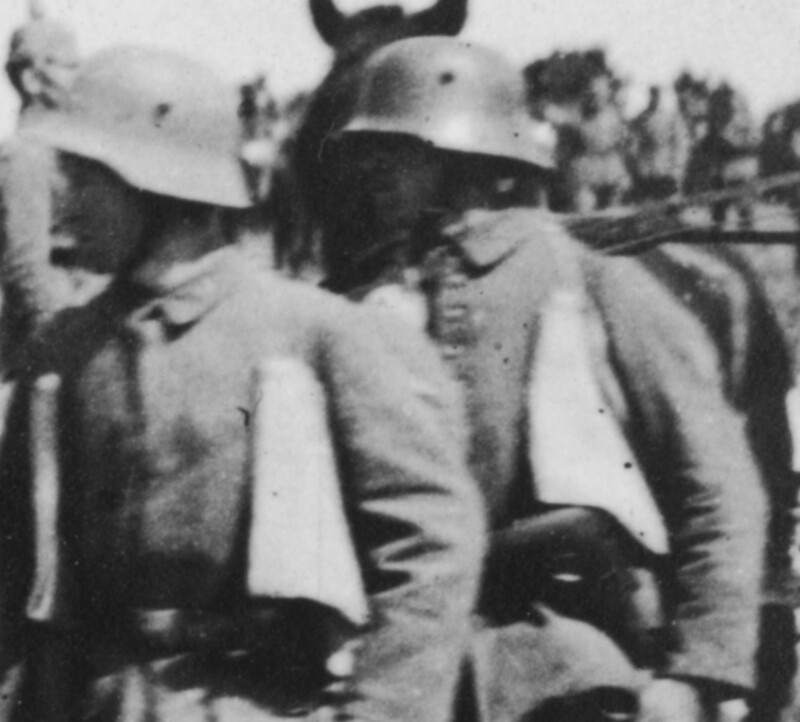 Photos of German soldiers wearing their helmets reversed are not unknown, but they are difficult to find. The lack of a chinstrap likely indicates that this man is on sentry duty, which would require unhampered vision. In this photo the sentry wears his helmet the right way forward. His vision—particularly to the sides—is markedly obstructed. 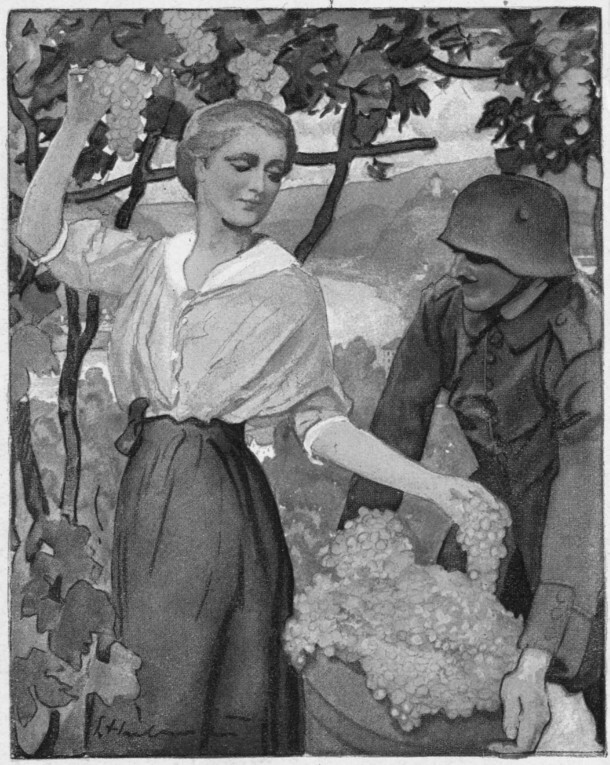 Next is an illustration by German war artist Martin Frost (1875-1928). 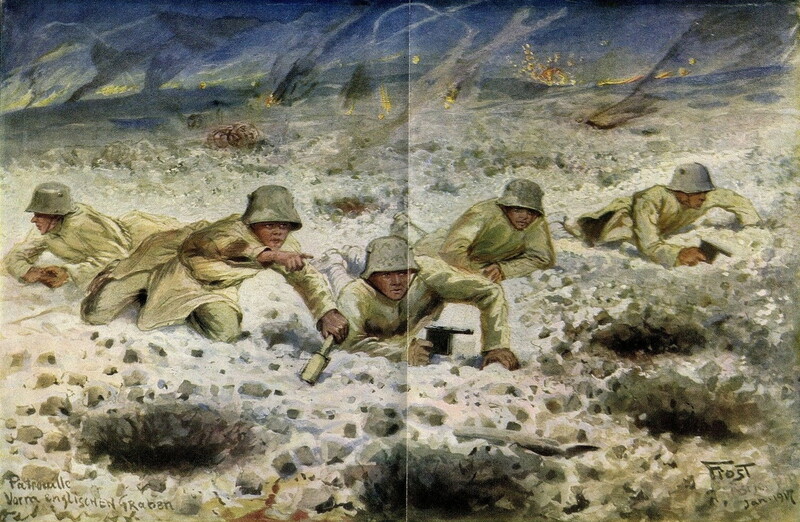 Dated January of 1917, it depicts a raid on British trenches. Three of the five men wear their helmets backward. It should be said that Frost was known for the accuracy of his paintings. 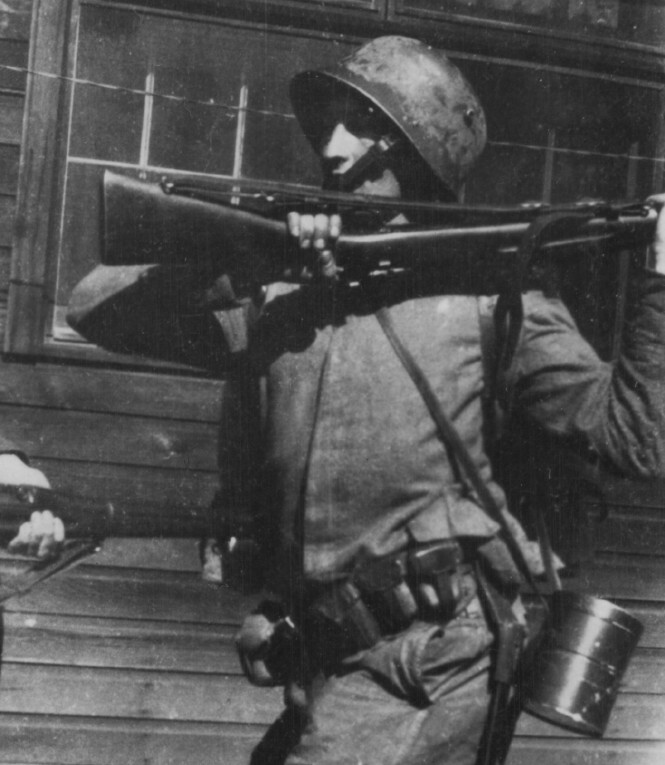 American soldier wearing German kit and posing as an assault infantryman. His helmet is reversed; I initially felt that he was just horsing around, but now I think he’s emulating something he saw or knew about. 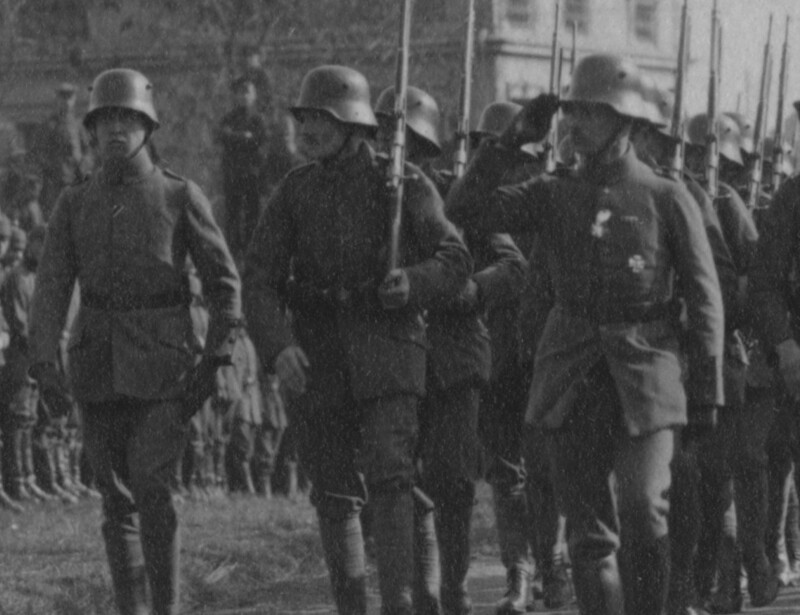 Beginning in 1917 German troops began modifying their helmets by cutting off the visor and part of the dips. Unlike the Turks, they left the bell as it was. I believe that this conversion had its origins in the wearing of reversed helmets. 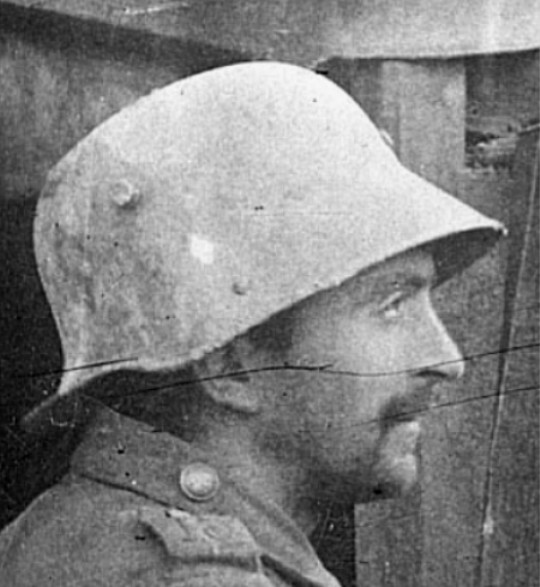 When viewed from the front, the cut-line of a German visorless helmet is always curved, matching the curve of the bell seen on standard helmets worn backward. 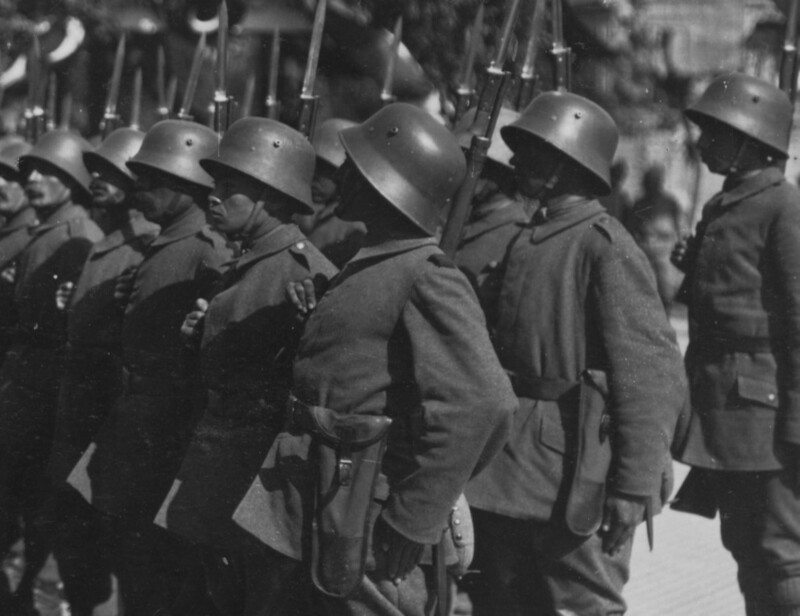 These assault troops are parading for Bulgarian officers in Galicia, May 18, 1917. The officer on the left wears a steel helmet with the visor removed. A closer view. Compare the curved cut-line with the straight edge of the visored helmets. 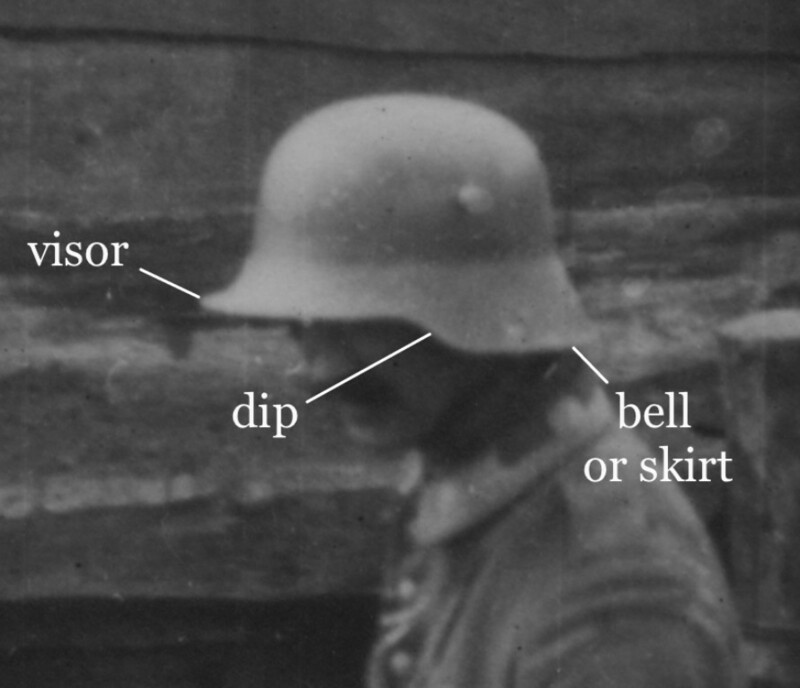 Both a front view (left) and a side view of visorless German helmets as worn by assault troops. This very well-known image shows soldiers of Landsturm-Infanterie-Bataillon Würzburg Nr. 1 in a dugout, waiting for the shelling to end so that they can man their posts. At least six men wear visorless helmets. Compare the helmets of the two soldiers sitting on the left; note too the complete lack of visor on the helmet of the man in the left foreground. 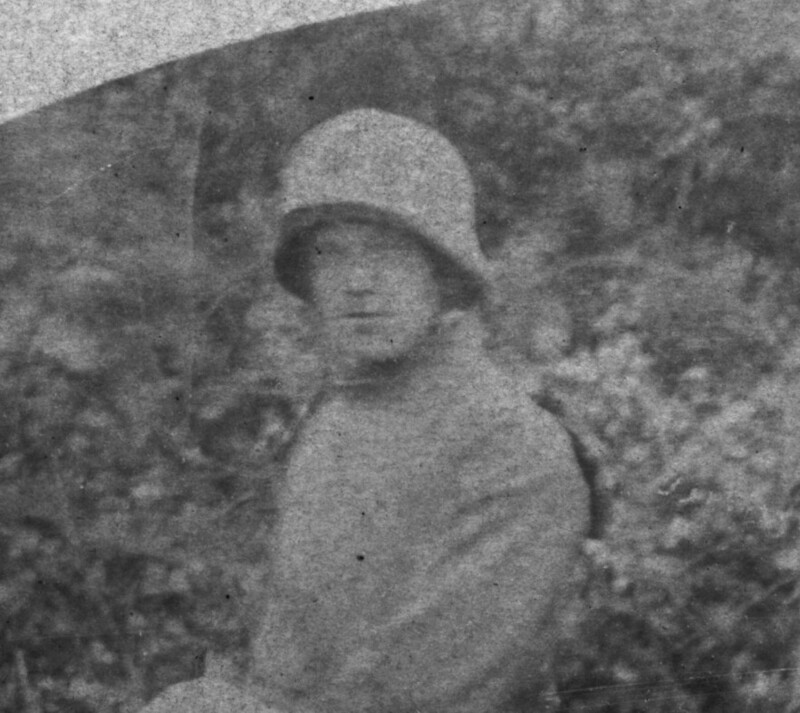 Though of poor quality, this photo depicts an assault infantryman equipped with steel body armor (Grabenpanzer) and a visorless helmet with a cloth camouflage cover. This officer of a Garde regiment has cut his helmet into a virtual bowl. The visorless German helmet is depicted in propaganda postcards; it must therefore have been somewhat known. A second, even more scarce model of visorless helmet was created by slightly trimming the visor and dips. Here the Machine Gun Company of Sturmbataillon Nr. 8 shows the standard helmet on the left and the trimmed version on the right. This assault infantryman also wears the trimmed helmet. The shortened visor is glaringly obvious. 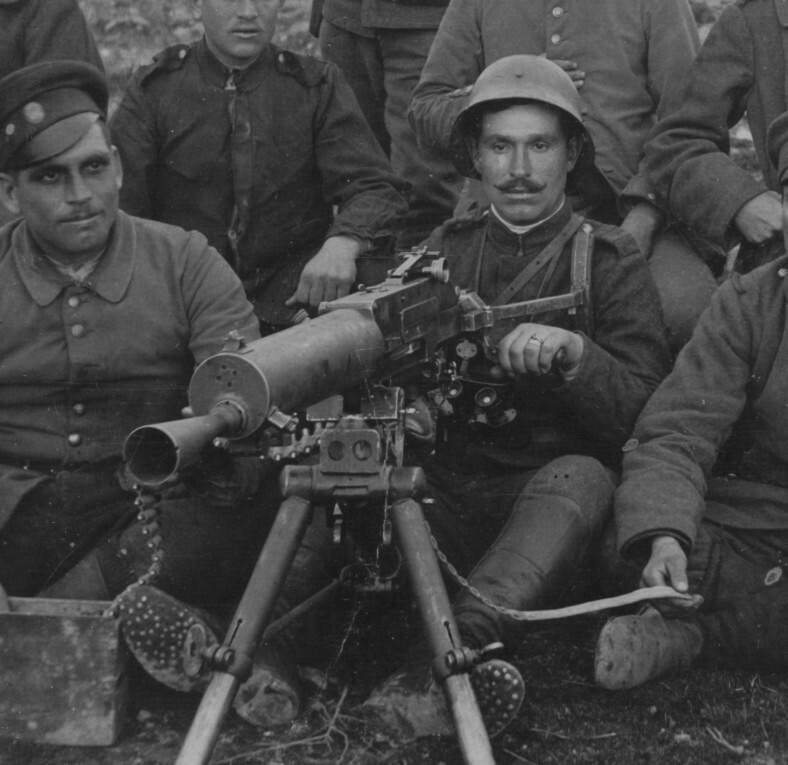 Flamethrower squad armed with the Kleif M.1917. The helmet of the lance operator (left) is distinctly different from those of the three other men. He seems to have trimmed back the visor and removed a substantial portion of the bell. As a result his vision and hearing would be vastly improved. 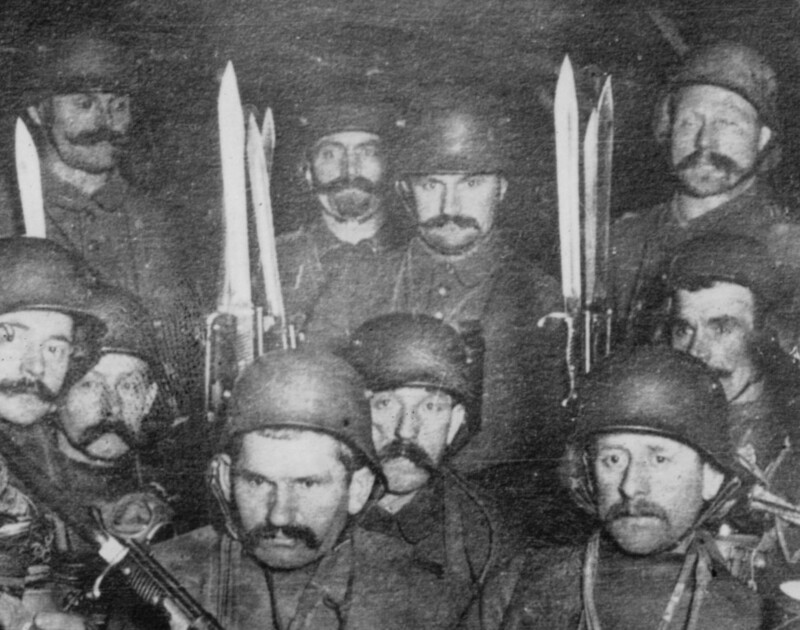 In the Austro-Hungarian army, the evolution of the visorless helmet began in the same way as in the German army. At first helmets were worn reversed. This commander of an assault battalion clearly wears the helmet backward in order to improve his vision. 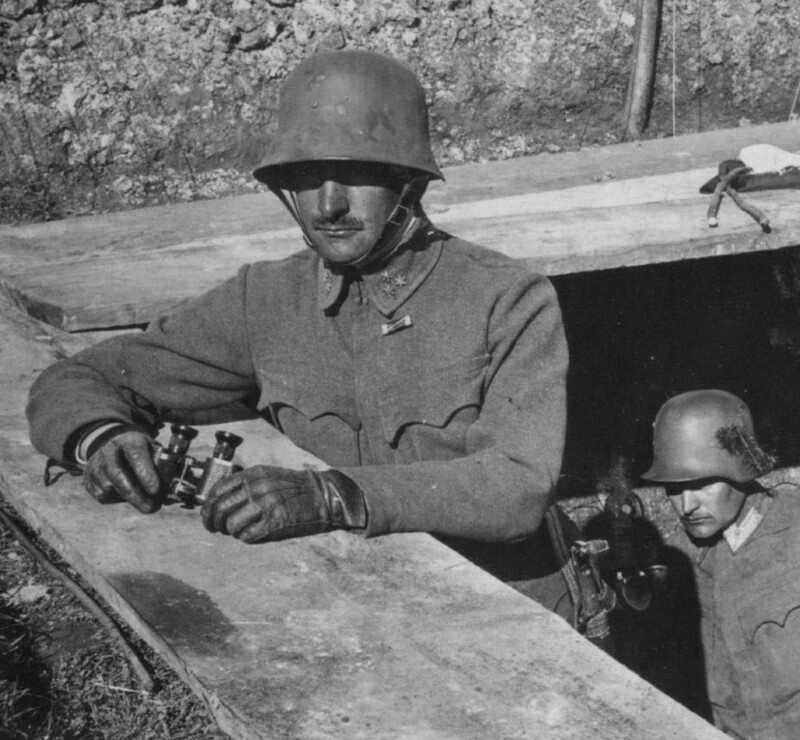 An Austrian machine gunner (right). His backward helmet has a cloth camouflage cover. 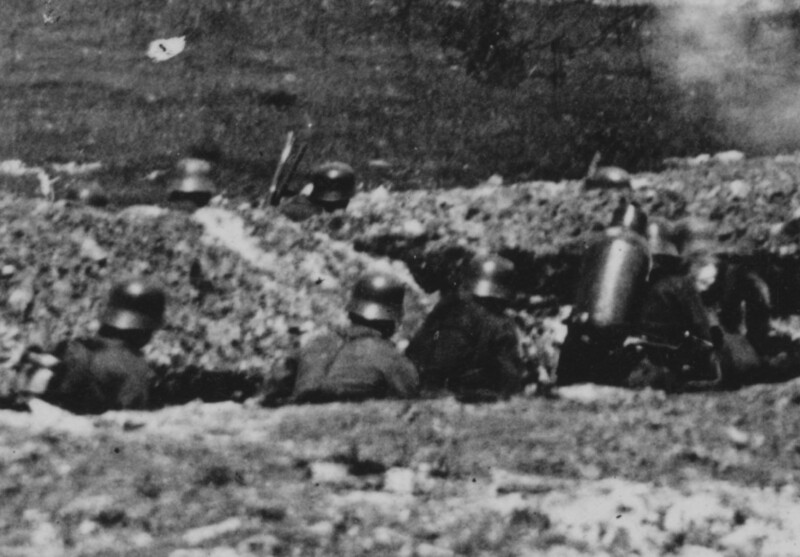 Every steel helmet in this Austrian assault unit is reversed. 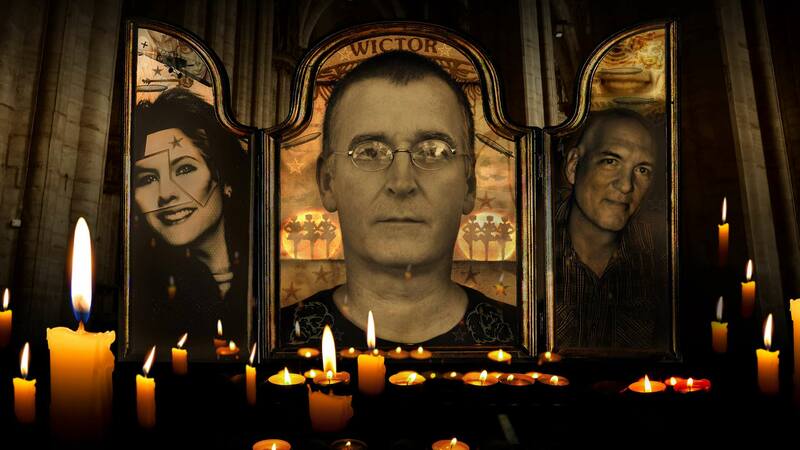 Photo courtesy Antonio Rosetto. 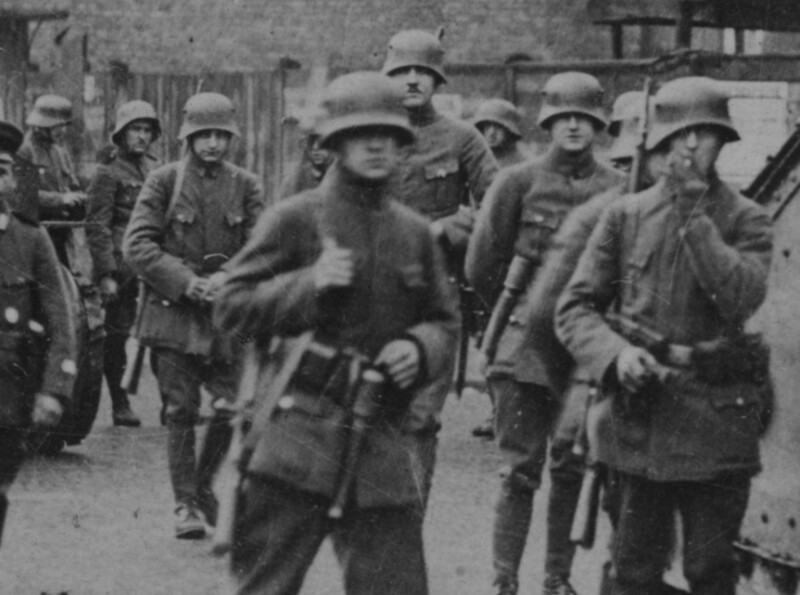 Beginning in 1917 the Austrians either issued visorless steel helmets or allowed the men to convert them. 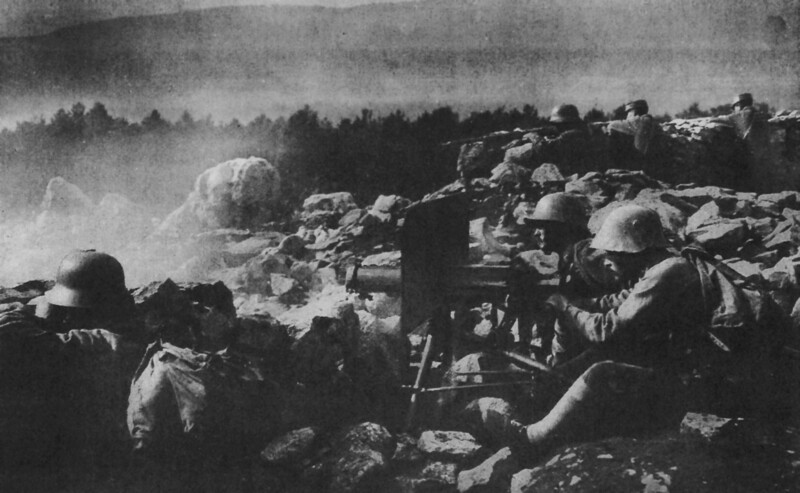 Trench-mortar pioneers demonstrate the curved cut-line of the visorless helmet (left)—the dips have also been removed—versus the straight lower edge of the visor (right). Officers of Tiroler Kaiserjägerregiment Nr. 1 wear two models of visorless helmet (second from right and left). 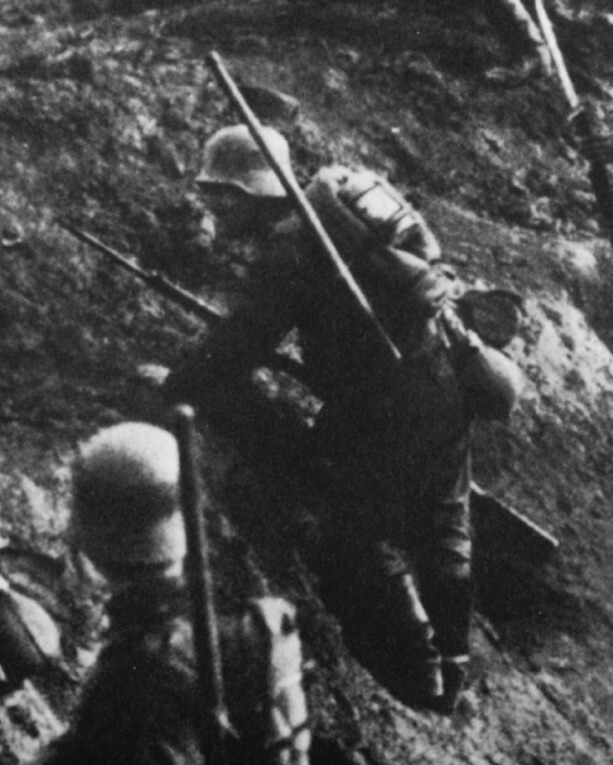 Sturmtrupp at Caporetto, October of 1917. 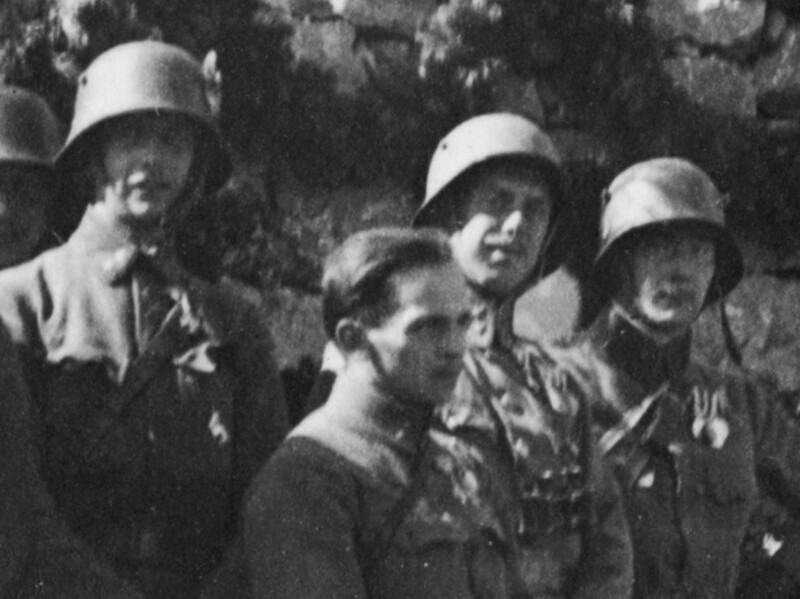 The man on the front left wears a visorless helmet, as indicated by the curved cut-line and lack of dips. The shape is quite different from that of the standard helmet on the right. 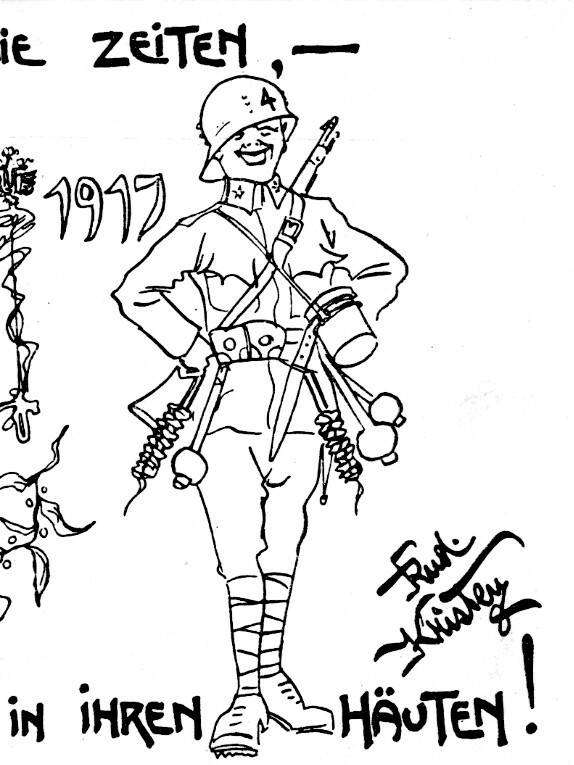 The visorless helmet was depicted in humorous propaganda art. Finally, the Bulgarian army, which like the other Central Powers began with reversed M1916 German helmets to improve vision. This machine gunner is the only man in his squad wearing a steel helmet. 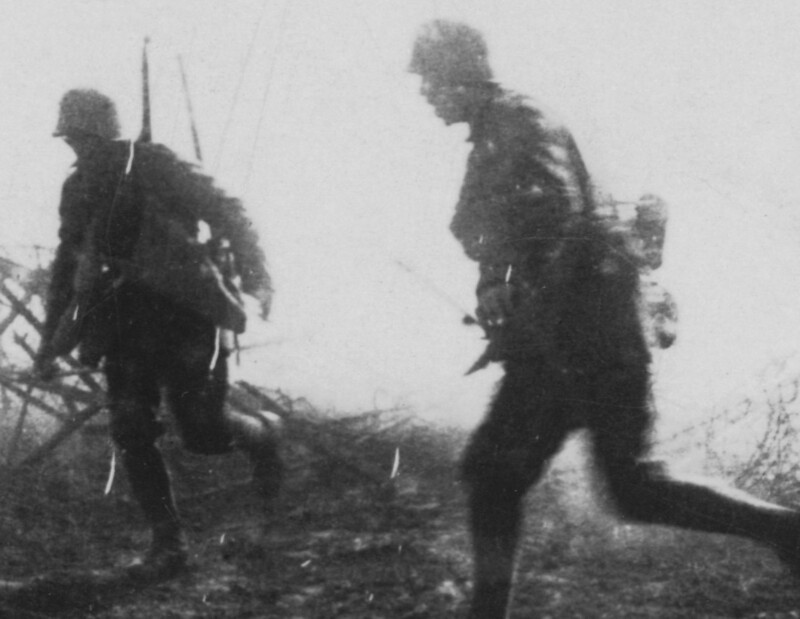 Like the Germans and Austrians, the Bulgarians cut off the visor in a curved line. This member of an assault platoon wears a helmet that appears to have been modified asymmetrically. The edges of the helmet seem especially thin and raw. 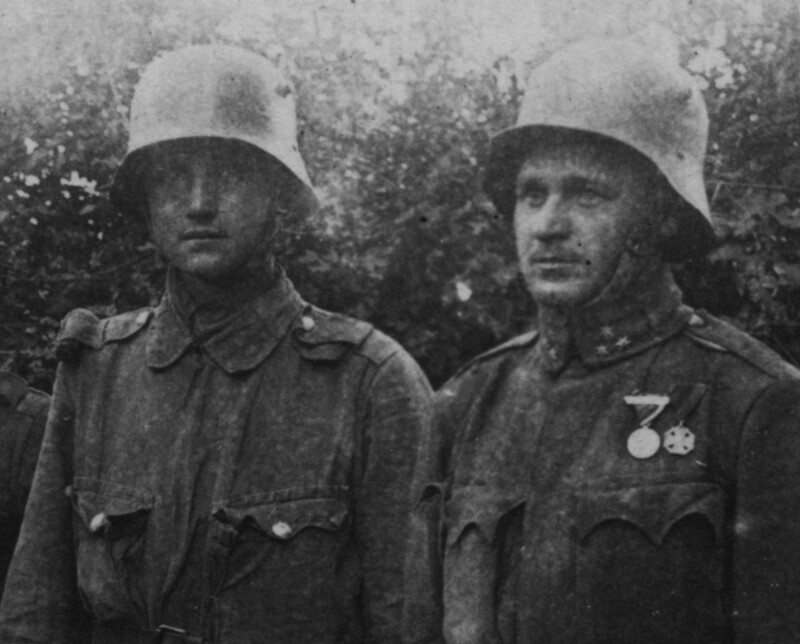 This poor-quality image shows that the Bulgarians also adopted the German “trimmed-visor” model. 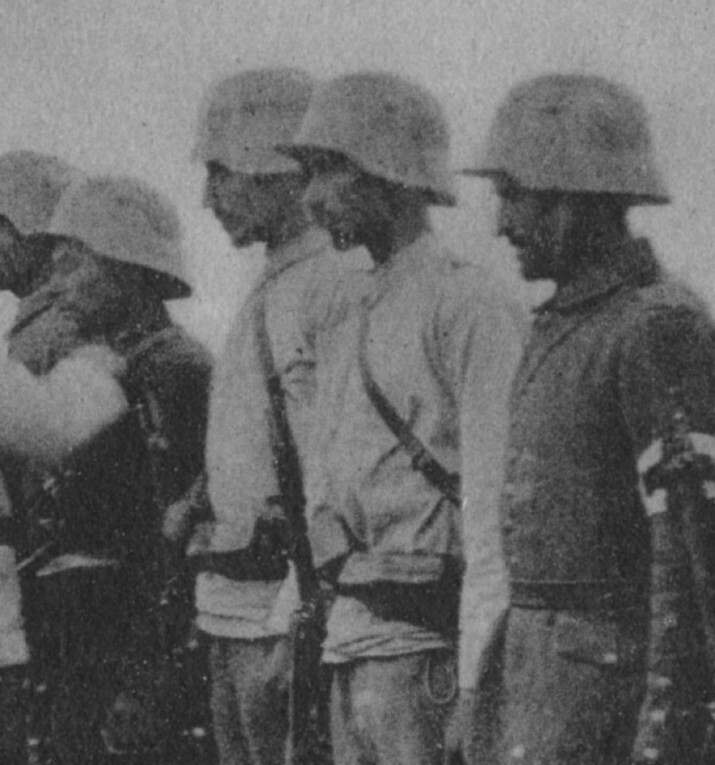 Assault troops after the Battle of Cerna are awarded medals; note the clipped visor on the helmet of the man third from the left. Also, the dip has been dramatically rounded. Official documentation of these modifications would be appreciated, along with any input. So far I have only photos and deductions. Please use the contact form if you have questions or comments.